We are in the age where data is much sought after and required for both good and bad purposes. It is no more a disputable issue that data of contacts and very sensitive files are being retrieved, recovered or easily copied for reasons best known to the perpetrators. Based on this realization, everyone with smart devices needs to keep their data safe and protected in a way that it will guarantee 100% safety. Especially you may not want your recent contacts on iPhone to be seen or your deleted contacts to be recovered by someone. Are there any guaranteed ways to protect my data? Yes! People will ask these questions and with eagerness to know. So how do I to delete recent contacts on iPhone even the deleted ones? You may already delete your contacts, but you don’t want it to be recovered by any means. You may sell your iPhone off, donate or give it out, or recycle it after sometime, which means that your phone gets to the hands of others whose actions you cannot vouch for concerning the data and information on your device. You could well expose yourself here. 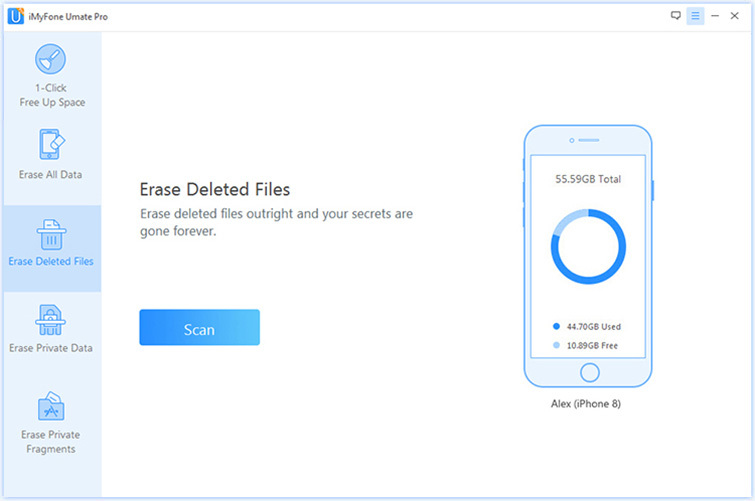 You should be aware that the various methods or features on your iPhone or iPads can delete them as illustrated but anything deleted or erased using such means can still be retrieved or recovered by data recovery software. 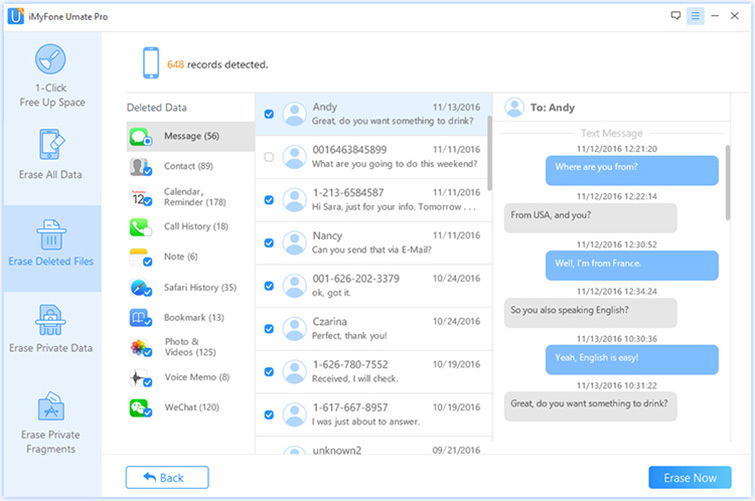 The unreliable delete and erase features on mobile devices makes it all important to have software like iMyFone Umate Pro for Windows or iMyFone Umate Pro for Mac which is capable of erasing permanently the recent contacts you already deleted. Erase data including calls, contacts, text messages, photos, music and videos. As well as erase messages of third-party applications like WhatsApp, WeChat, Viber, Kik. 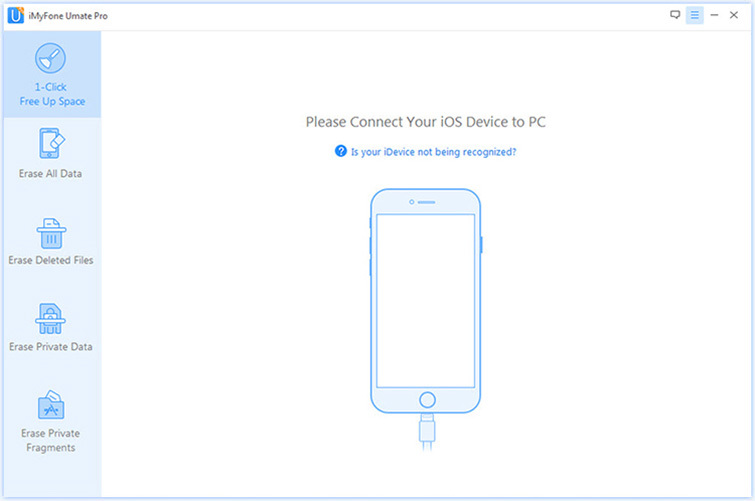 Can be used as a factory reset application because it can totally and completely format your device leaving no file or data available or recoverable by any means. Note: To erase data in any erasing mode, including “Erase All Data”, “Erase Deleted Files”, “Erase Private Data” and “Erase Private Fragments”, please turn off “Find My iPhone” first. Step 2: Click the Erase Deleted Data tab, click "Scan" and then iMyFone Umate Pro will start to scan the device. It will take several minutes to finish the process. Step 3: It will list all your deleted data including photos, messages, contacts etc. You can click to preview your deleted recent contacts. Select files which you want to erase, click the Erase Now button. Step 4: Type "delete" into the box to confirm. Of course if you want to change the security level, you can click the link to change the level. Please read the security level settings carefully. 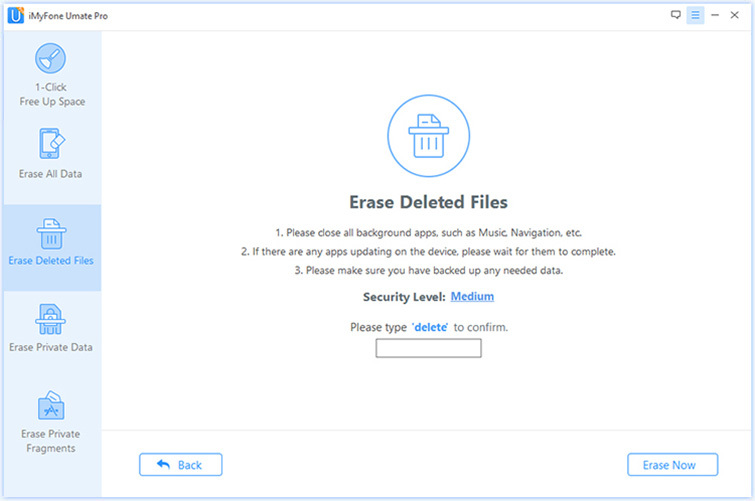 Step 5: After you manually type 'delete' into the box to confirm your action, and then click the Erase Now button to erase the deleted data. After the process finishing, your recent contacts will be wiped out and erased permanently! Step 5: Pull it down to the bottom you will see the Delete Contact icon, click it and then confirm the action. 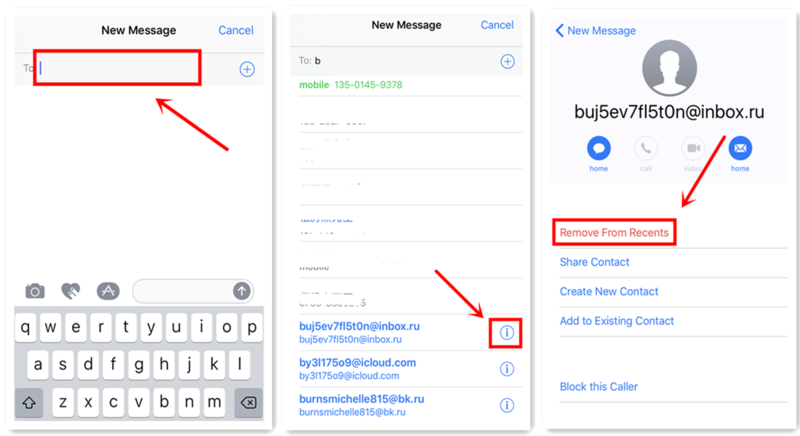 Following the steps above, your recent contacts will be successfully deleted on you iPhone or iPads. For every user of the Apple iPhone and iPads, it is a common feature on their mobile device to have recent contacts showing or popping up in text history. This feature is quite exciting as it allows you to easily and seamlessly add names of any of your contact you wish to send the text to. However, this feature also pose some challenges to users and as such they wish they could just delete the recent contacts from the text history. A lot of people may not know how to go about this on their iPhones and iPads but it is a very easy task and you should follow the steps below to know how. Following the steps above, you will successfully delete recent contacts showing in your text history. In conclusion, we sincerely hope the article has either improved your knowledge of how data and information on your Apple devices can be well protected or make you aware of the effective and awesome software- iMyFone Umate Pro that can erase your recent contacts permanently and protect your data and files thoroughly. We would like to read your comments about the article while you can also contact us for more information.